Custom kitchens and cabinetry that range in style from traditional and timeless to radiant, bold and contemporary. Learn more about our many product lines. With countless colour and design options, you can pick and choose as you please to create a truly custom kitchen that reflects your personal style! 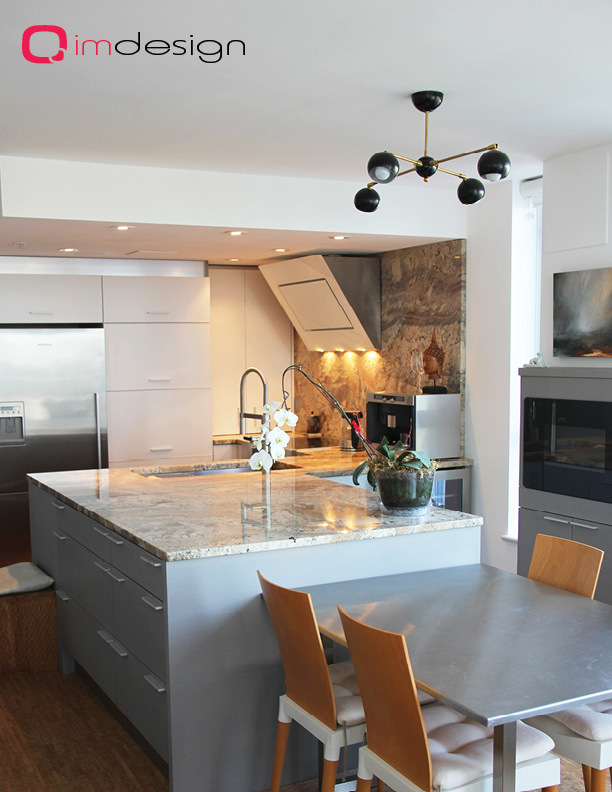 Take a peak for yourself, and see how an aluminum kitchen design can truly transform your home. Look through some of our many beautiful projects. We design, manufacture and install custom kitchens and cabinetry, outdoor furniture, and indoor furniture that are made from aluminum. IMDesign provides personalized service to meet all of your individual needs. Our professional assessments and innovative designs are backed by more than 25 years of experience, both in Canada and Europe. Why we love Aluminum, ... and you will, too! 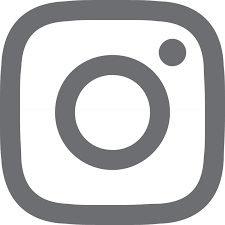 Aluminum is the metal of choice for leading designers, architects and engineers, all of whom are looking for a material which combines functionality and cost-effectiveness with forward-looking form and design potential. Aluminum is a truly unique metal. With its durable, light-weight, environmentally sustainable characteristics, it presents a compelling alternative to traditional kitchen cabinet options. An IMDesign kitchen gives you all the beauty and style of a modern kitchen while keeping your environmental footprint at a minimum. It's also a non-toxic, healthy alternative to traditional building materials. What more can you ask for? The kitchen that Santi and Patricia designed and installed for me is everything I asked for and more. They used the space I had and created more counter space and storage. I love the way it looks and it feels, it's great to use. They were so helpful and understanding and gave me many options and colours to choose from. My new kitchen cabinets make my whole house look fresh and modern. It is important to me to have healthy materials and aluminum is perfect because it has no VOCs or off-gassing and the quality is impeccable. I am so thankful for my beautifully functional kitchen. IMDesign provided a free consultation and estimate. I had a few ideas of my own. It was amazing that Santi knew just what to do to make my perfect kitchen. Custom design is so much better; everything fits beautifully. I love the quality and clean indestructible aluminum and the clever ideas for the use of all the space. We love our kitchen!! The price is close to any other ready built without having the hassle of doing the work! We worked with Innovative Modern Design, when we were transitioning our weekend get-away to our full-time retirement home. Our dream had been that one day we would retire from our jobs, and live full-time on Pender Island, BC. We wanted to upgrade our kitchen, and called upon Innovative Modern Design to visit our home, and come up with ideas for us. The end result was a huge surprise and a welcomed one from this young professional couple who brought their ideas and state of the art drawings of possible outcomes. Patricia and Santi provided us with excellent service, including helping us with the design which turned out to meet our needs very well. The cabinets were made in a timely manner and the installation was professional and done with great care and attention to detail. When we requested backsplashes that were not part of the original order we were accommodated quickly and well. We have had the new kitchen for almost four years and we are extremely happy with it. It is beautiful - the brick red colour we chose and the cabinets are excellent quality and work very well. We hired Santi to build weather-proof cabinetry for an outdoor BBQ in a modern beach-front home. He was able to match the paint colour we requested and make the cabinets fit perfectly to accommodate plumbing and gas fittings. They have been in place now for over a year and still look new. We were so pleased that we then hired him to build cabinets for a bar area and bathroom. These spaces were very unique, unconventional shapes, and again the cabinets fit perfectly. In conversation it also came up that we were looking for ideas to add bug screens to our commercial-style windows. I have worked with Patricia and Santi for several years. This is our first project which encompassed an open concept kitchen and three bathrooms in a contemporary cabin on Pender Island. The end result was beautiful and creative, and Santi was very accommodating with my many requests for customization and advice. They also helped source countertops and pulls since it was an awkward project being on an island! Thank you Santi and Patricia for the excellent work you did in our home. 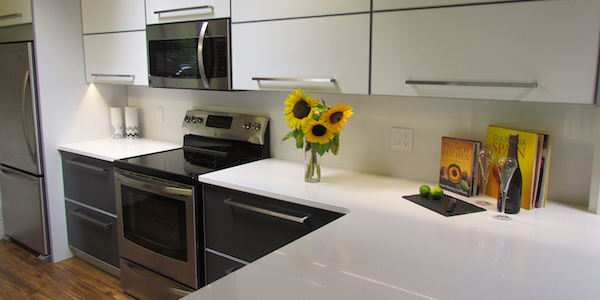 We wanted to update our 'tired' condo and enjoy the practicality and sleek appearance of your aluminum cabinetry. You worked with us and with our space to create a beautiful kitchen and closet doors throughout our home. We appreciated the time you took; your ideas and attention to detail. You truly are 'problem solvers'- you found a way to overcome issues within the existing condo that gave us just what we wanted- beauty combined with perfect functionality. Thank you! 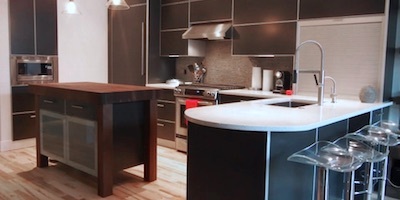 Innovative Modern Design offers a unique product - cabinetry that is made of aluminum rather than particle board or other wood based or plastic based materials. 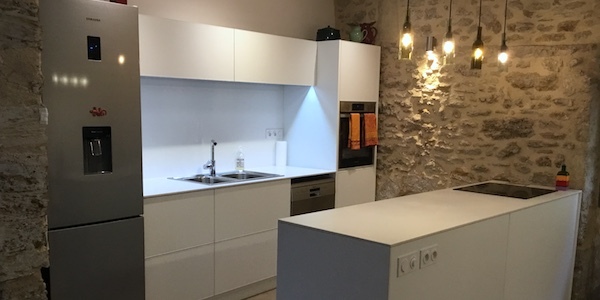 The result was a unique kitchen that was modern, timeless, durable, and did not present any off-gassing to taint the customers' food or wine glasses. I was most impressed by the fact that they take personal pride in their product and the service they offered and this is evident through their detailed measurements and meticulous work. I got exactly what I was expecting. We have lived with the cabinetry for six years now and are very happy with how easy it is to maintain (simply wipe it with a damp cloth) and how smart it looks. It will maintain its modern appeal as long as we are in this house -- European good looks!